On an epic journey to the iconic Red Centre expect a confrontation of outback landscapes, colours and a surprising variety of wildlife. To travel to the centre of Australia is to discover a completely different part of this fascinating continent, one the majority of Aussies never see. Yet, it has formed and shaped our nation in many ways – it’s a history worth discovering, and remembering. 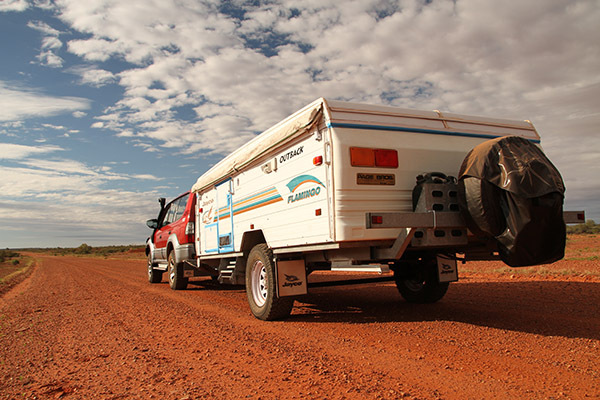 Travelling to the Red Centre should never be attempted without adequate preparation and familiarising yourself with the places you’re going to explore. Let me share some of the things we learned during our seven-week adventure in the Territory. Preparation is the key to any successful trip but this is especially true when you head into remote and isolated areas. Sure, Alice Springs is a large town with excellent facilities but when your car or rig breaks down along a dirt road in the middle of nowhere, it can be a long and costly process to get back to The Alice. Servicing your car before you hit the road isn’t just a good idea, it’s essential. Having good-quality tyres is not a negotiable if you’re intending to go off the beaten track for extended periods of time. Some of the dirt roads can be badly corrugated and cheap tyres simply won’t last. Putting together a comprehensive tool kit can get you out of most precarious situations. Our basic equipment consists of an air compressor, digital tyre gauge, jack, multi-tool, shovel, grease, occy straps, cable ties, multimeter, batteries, jump leads, fuses and duct tape. Your camping rig deserves to get the same attention as your car. Again, don’t skimp on tyres as quality rubber will be cheaper in the long run, and save you the inconvenience of a flat tyre when you least expect it. Make sure the wheel bearings have been done and dustproof your rig as much as possible. A tube of white silicon is all you need to cover areas that could potentially turn the inside of your van or trailer into a red dust bowl. Opinions differ as to when the best time is to visit the Territory. The general consensus is between April and September. Personally, I prefer May as April can still be very hot during the day, turning any decent hike into a major challenge. It also means the flies are still around which can be extremely annoying. The weather tends to cool down in May whereas the evenings are still comfortable. Come June, you could be facing 5°C nights or lower, which are a guarantee in July and August. ou can enjoy most places without having to book or worry about finding a secluded campsite. June is considered the start of the peak season which continues in July and August, only to taper off in September. It pays to keep an eye on NT school holidays as a lot of locals like to head bush. Central Australia has a very different climate to most parts of Australia. The area around Alice Springs is situated in the arid zone, which basically means the average rainfall is 200-300mm per year. Contrast this to an average yearly rainfall of 600mm in Melbourne. Add to this warm to hot weather during the day and potentially freezing temperatures at night. In other words, you need to bring clothes for every season. It also means a warm doona is not just a luxury, but a necessity. The rain, however, can come with its own set of surprises. Some years, this part of the Territory receives little to no rain at all, resulting in a drought. Other times, rain buckets down for days and causes floods. We found ourselves flooded out at Kings Creek Station in early May when a massive rain depression dropped more than 30ml of rain within 36 hours, flooding creeks, rivers and roads. National parks were closed, roads were damaged and some tourists were trapped. Carrying extra food and water can be a matter of survival in this part of the Territory. Distance takes on a whole new meaning in these parts where locals travel half a day to get to Alice Springs to stock up on groceries. If you think you can see the best the Red Centre has on offer in a couple of days, think again. 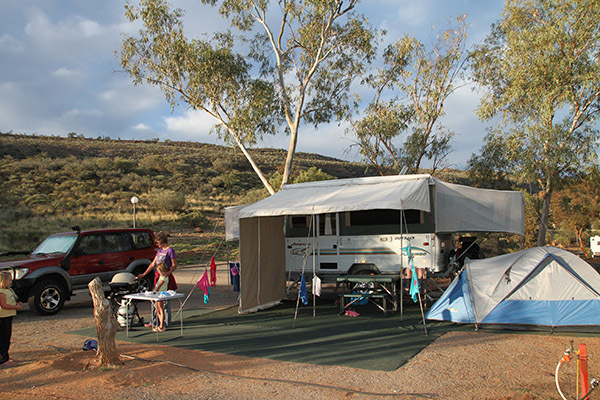 We spent nearly two months exploring the national parks surrounding Alice Springs and still wished we’d had more time. Make sure you know where to fuel up next as you don’t want to run out of the golden liquid halfway down the dirt road on the way to Palm Valley or Chambers Pillar. Prices will vary so it pays to plan ahead. 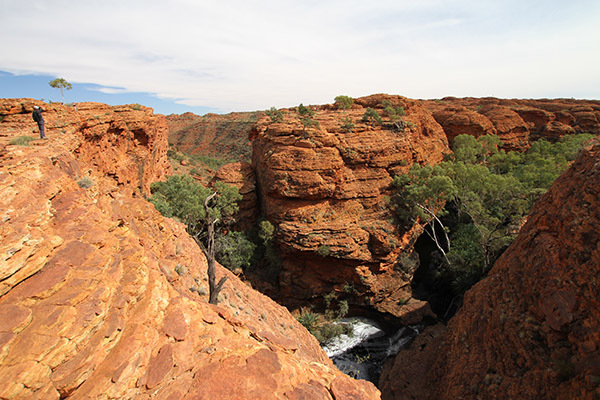 The best way to explore the ochre-red ranges, magnificent gorges and cool waterholes is on foot. The Kings Canyon Rim Walk is in my view one of the most spectacular hikes in Australia and definitely a bucket-list item. The 6km walk can be completed by anyone with reasonable fitness but you need to come prepared. Temperatures can soar into the high 30s within hours so starting early is essential. Carry plenty of water; the rule of thumb is one litre per person per hour. Wear appropriate clothing, footwear and a wide-brimmed hat. Sadly, many travellers attempt long hikes in the heat of the day without bringing sufficient water or food and end up suffering heat exhaustion. Central Australia is home to an amazing variety of wildlife. 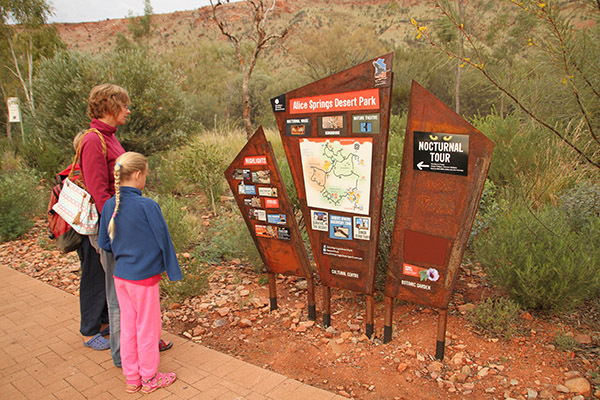 One way to discover the different creatures is to visit the Alice Springs Desert Park where you’ll learn everything there is to know about life in the desert. Kids will love the bird show as well as the nocturnal house and ranger talks take place throughout the day. Allow at least half a day as there’s a lot see and experience. Visit www.alicespringsdesertpark.com.au for more information. However, the best way to learn about the unique wildlife is to head to one of the many national parks to see many creatures face-to-face. Dingoes roam freely in the Red Centre, foraging for food wherever they can. For this reason it’s important not to leave your rubbish lying around because it will attract these wild dogs and they can be nasty. Big reds call the deserts home though numbers have declined rapidly and we only saw four red kangaroos during our entire trip. Brumbies are commonly seen on the way to Palm Valley and Chambers Pillar, as are wild donkeys and camels. Snakes are around but tend to be invisible as it is too cold for them to venture too far. We discovered one baby carpet python at the campsite at Palm Valley but didn’t see any other snakes. You’ll come across plenty of skinks, dragons and geckoes in this neck of the woods and birdlife abounds. 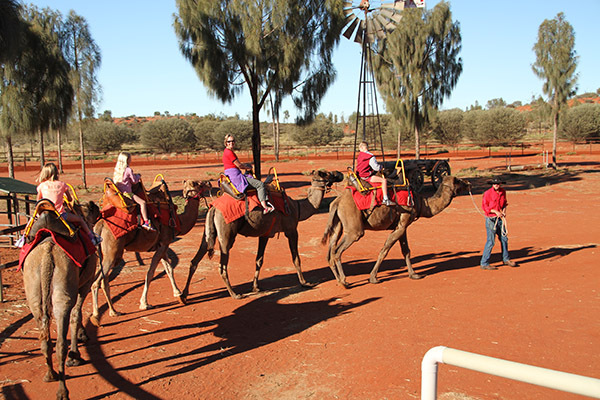 Central Australia is a destination which should be part of any bucket list. The landscapes are dramatic, the camping is spectacular and you’ll undoubtedly go back for more.